A while back my dad asked me what my plans were for the upcoming long weekend. I didn’t have a specific fishing trip planned for this time and was keen to hear what his plans were for this time – because as we all know, long weekends are supposed to be spent on the water! He invited me to join him for the upcoming Barberspan Bonanza and I was excited to fish these waters again! It has been several years since the two of us have fished this venue and with what we have learned since our last visit we were positive that we would achieve better results at this promising venue. We invited Aubrey Mardon and his son, Michael, to join us on this trip as well as Parrish and Kyle Genricks which would join us later on. 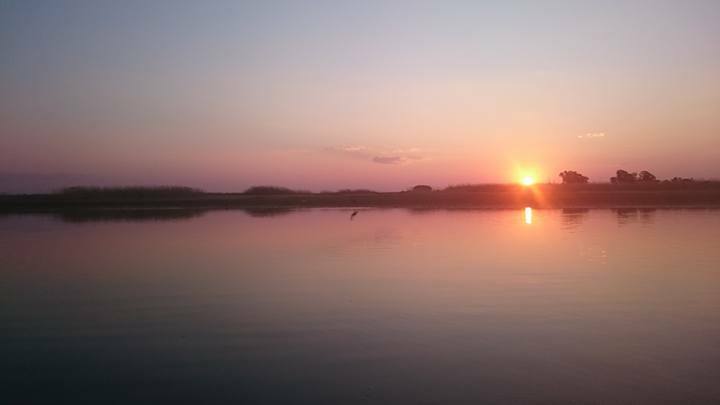 Barberspan is world-renowned for its bird life and forms part of the RAMSAR protected wetlands. Half of the dam is therefore closed to boats as this area is dedicated to the conservation of numerous bird species. Yet, the section which does allow fishing still holds many opportunities for the avid angler. The pan is a natural pan with no dam wall and one river that feeds it (with Taung Dam far upstream from it). The pan is home to thousands of Sharptooth Catfish and Carp of which both species grow to decent sizes at this venue. 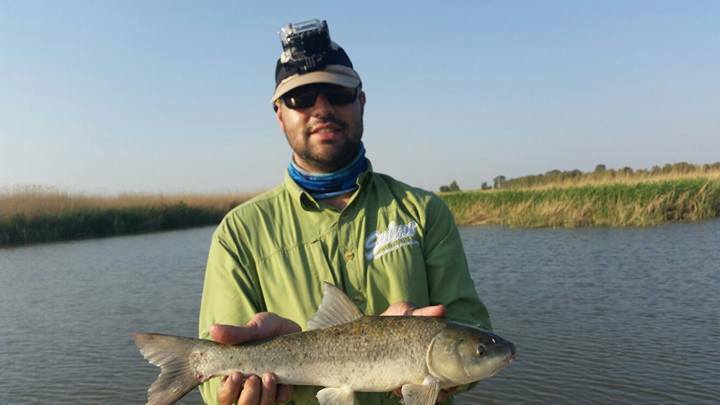 Other species which is also available is the Moggel, Orange River Mudfish, Smallmouth –and Largemouth Yellowfish. The carp tend to tail in the shallows in high numbers, while the catfish is found all over the dam where they hunt Moggel and Carp. The other species are sometimes caught, but are not always catch-able on fly or lure. My aim for this trip was to improve my long standing personal best catfish of 18.68 kg and have some fun targeting carp on sight on fly. I have been heart set to break the 20 kg mark on catfish for more than a decade; hopefully I could achieve this goal on this trip. We arrived at the dam on Thursday afternoon and after settling in at the Pelican House at the Bird Sanctuary we hit the pan for a short afternoon session. Our first visit was to the river inlet to see what is going on in this area. 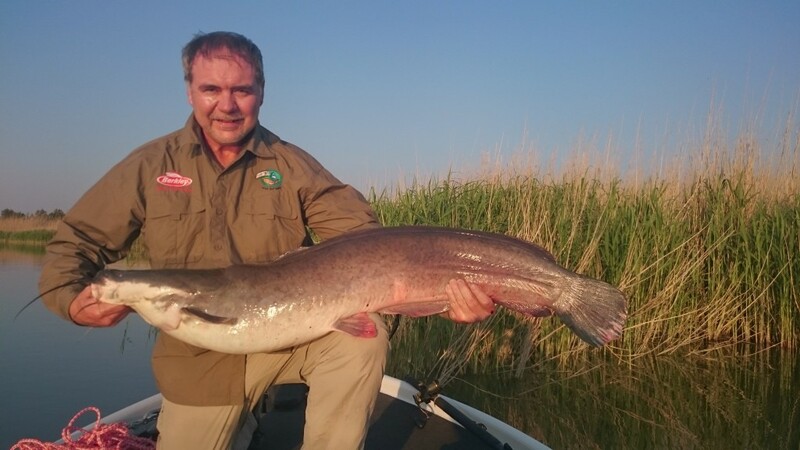 On arrival we noticed some promising looking reed beds – time to catch some catfish on the calling method! With the first calling we were welcomed with shaking reeds as the cats reacted to our “dedicated noise”. Soon after my dad went tight with the first catfish for the trip and Aubrey and Michael also went tight with small cats. I missed a small one after which we decided to move on upriver. We noticed a few small schools of catfish gathered on the surface with their whiskers piercing the water surface. Normally these catfish are very skittish and will only take a small leadhead dipped on their whiskers (pure reaction strike), but I decided to dip them with the Madpumkin. I wasn’t surprised when the cats spooked as I dipped the large Madpumkin on their whiskers – a big lure for these skittish fish. We continued moving upstream and noticed a few single Moggel cruising on the water surface, but we purposefully ignored these difficult buggers. High up in the river we caught several catfish on calling, mostly small fish (8kg and smaller). Michael caught a few cats on casting with a crankbait. My dad also caught a few and also managed to foul-hook to big Moggel while cranking for the cats. The river had lots of activity with several catfish (big and small) turning on the surface and we also saw how a massive school spooked in ankle-deep water. I decided to call in this area – just a little bit deeper (about 40 cm deep). I noticed several swirls, mud clouds and bubble clouds rise next to the area I was calling – clearly a few cats came to inspect this disturbance. I continued calling and was rewarded with a solid hit…followed by an explosion of water as the catfish was splashing about! After a short, nut vicious fight the fish was netted. In the net the fish almost broke our landing net as it shook around trying to escape. The cat weighed in at 11 kg – my big fish account was open! After a few photos the fish was revived and released. We decided to start working back as it was getting late. The catfish were turning all around us as it was getting late. My dad decided to try his casting setup for the catfish – he would try casting his Fast Sinking Madpumkin catfish as soon he sees the rise with the hope that the cat comes back to inspect the noise he makes. My dad noticed a few rises close to each other and with a smooth cast he placed his lure among these fish. He engaged his drag and continued talking with me. While he spoke with me his line pulled straight as a catfish stormed away with his lure engulfed! This was a big boy as he pulled my dad hard – even pulled the boat! My dad fought the fish quite hard as he bullied it away from close by reed beds. A few times the cat tried to wrap him and his tackle was put under enormous strain! After about 15 minutes the fish came up and I got the opportunity to net the brute! 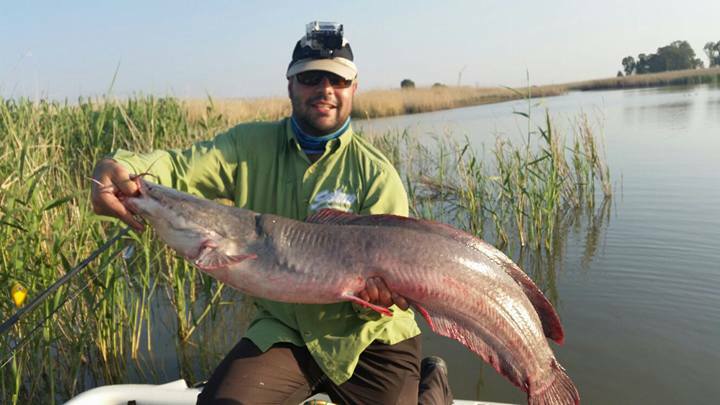 This brute pulled the scale to 19kg – what a fantastic catch on “bass tackle”! We took a few snaps after my dad had a quick rest (who needs a gym when catching these brutes?!) and then released the monster. We headed back to camp with smiles all around and then enjoyed a good braai while sharing our fishing stories next to the fire! Don’t miss out on Part 2 of this adventure coming soon!